Korean May Day Celebration yesterday in Seoul, South Korea. North Korea’s life expectancy dropped by 5.5 years to 67.2 years in 2002 from 1993. According to a report on reproduction and health by the North’s population research institute, sponsored by the United Nations Population Fund (UNFPA), the life expectancy for males in the North fell from 68.5 years to 63.1 years during the 10-year period, while that for females declined from 76.1 years to 71 years. It is the first time that a report by the North has been released in South Korea although there have been many reports on the health and medical condition of the Stalinist country by international organizations. 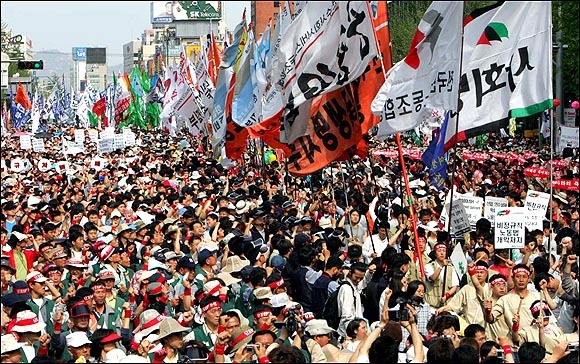 The report said a total of 23.31 million people were living in the nation as of 2002, which increased from 23.15 million people that the Korean Central News Agency, North Korea’s state-run news outlet, said as the 2001 population. As of 2002, South Korea’s population totaled 47.62 million and its average life expectancy amounted to 77 years. The average lifespan was 73.38 years for males and 80.44 years for females, according to the National Statistical Office of the South. North Korea test fired a short-range missile that plunged into the Sea of Japan Sunday, the White House chief of staff said, adding he wasn’t “surprised by this,” noting Pyonyang had conducted similar tests in the past. North Korean test launches are often considered moves to strengthen its hands in dealings with critics. It test-fired short-range land-to-ship missiles into the ocean on at least three occasions in 2003 during an international standoff over its nuclear weapons program.